Far-off fans of Garrison Keillor’s Prairie Home Companion may think that the only way Midwest Lutherans feed themselves is by way of potlucks. So, as Lutheran Social Service of Minnesota (LSS) was building its Center For Changing Lives (CFCL), one might have thought the lunchroom would be ringed with refrigerators filled with Jell-O salads of various size, shape, and color. Instead, CFCL staff decided that the ministry center offered an opportunity for a partnership between volunteers from local congregations and work clients of LSS Employment Services. Staff members generally come to the Center Café through a mandated program, often prison diversion or treatment center recommendation. “We asked ourselves how the Center for Changing Lives could be a community building without having a coffee shop,” explained co-manager Mary Lundquist. Food and fellowship are central to the work of the CFCL, she said. At first they considered a Dunn Bros Coffee, or a similar franchised site. Then they asked themselves about the goals of the operation. “We had three goals,” said Lundquist, a 45-year member of Messiah Lutheran Church, housed in the CFCL. “First, to provide nutritious food at inexpensive prices. Second, to employ people from MFIP [Minnesota Family Investment Program] or LSS-related programs. Third, to offer a place of hospitality, so that the Center feels like a part of the community.” Once these goals had been agreed to, it became clear that a more indigenous organization might be best. So, now the Center Café can offer coffee for free and soup for $1.50 most days. With such affordable meal prices, the café only is expected to bring in an average of $50 per day (or about $10,000 per year), which, of course, is an unsustainable business model. 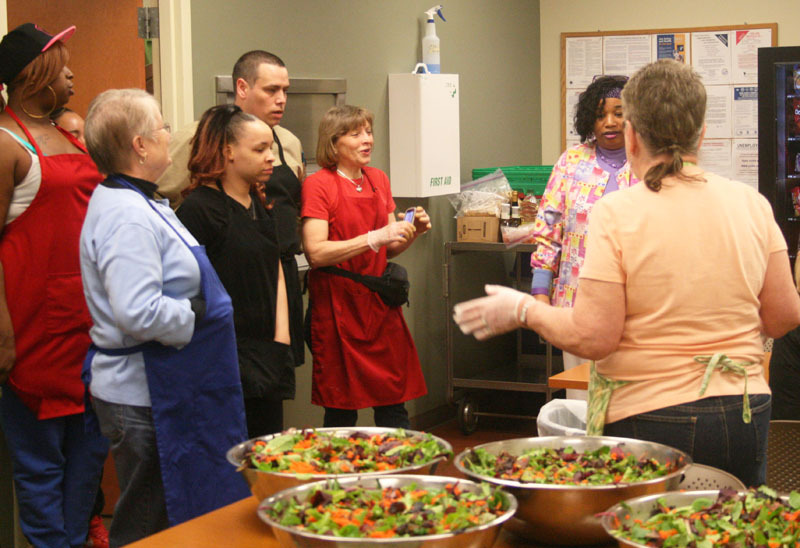 In addition, however, the Center Café offers a catering service; that is what pays the modest wages to the staff members, most of whom started as work clients who came by way of diversion programs. The catering project makes up the remainder of the $100,000 budget. Staff members generally come to the Center Café through a mandated program, often prison diversion or treatment center recommendation. If their work experiences are positive, however, these individuals can be added to the staff, qualifying for the wages paid out from the catering efforts. 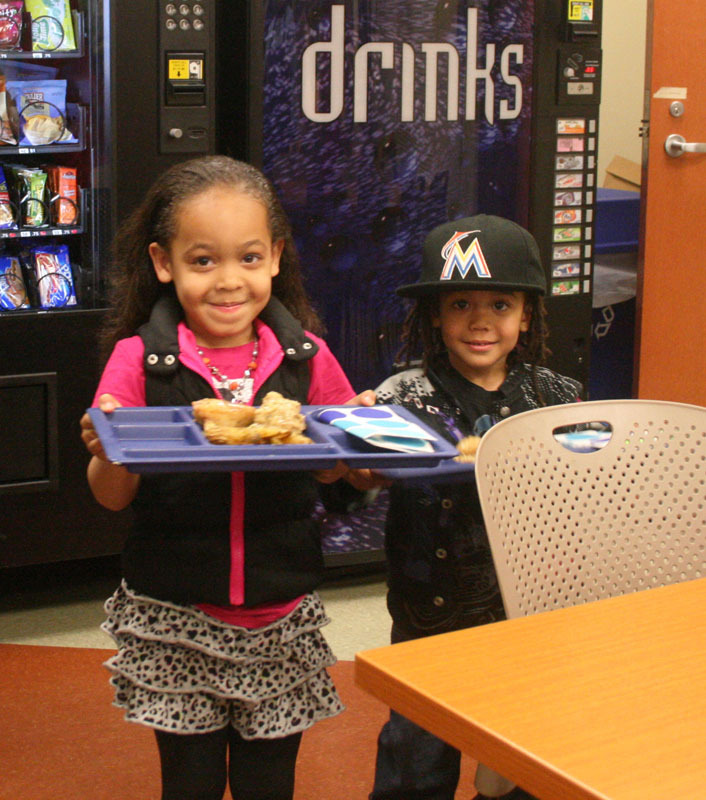 In addition, the Center Café offers three free community meals each week. A Thursday noon lunch draws about 125 people — professionals from area businesses and people living in the neighborhood. While the food is picked up buffet style, everyone eats around shared table in the CFCL’s conference space. The Center Café at LSS’ Center for Changing Lives provides a buffet-style meal for people living in the community. A Tuesday noon Bible study draws about 30-40 people for a shared meal. And, a meal after Messiah’s Sunday worship brings about 40-50 people to the Center. The free meals would not be possible without the support of Second Harvest, a local food distribution network. “We are able to serve good food at a very low cost to us,” Lundquist told Metro Lutheran. Good food, shared table, fellowship. The Center Café has figured out how to get the best of potlucks … but with a dollop of justice on the side.